Monroe Aerospace’ catalog is the most comprehensive hardware catalog in the U.S., with a wealth of information used by design engineers, purchasing agents, and repair personnel. Our catalog is used by university aviation departments to train future students of aviation engineering and maintenance. The catalog is free with a call to Monroe Aerospace at: 1-800-330-3975 and is available on-line for you to download at www.Monroe Aerospaceinc.com . A copy of the catalog on a flash drive will be available by midsummer. Monroe Aerospace’ website has tier pricing for the first four quantity tiers for registered customers. Please call for pricing if the line quantity does not meet your requirements. A discount program is in place to apply appropriate percentage discount based on your yearly sales. Call for the discount applicable to you based on your yearly sales and discounts necessary to meet your hardware budget requirements. Monroe Aerospace will pack your hardware to your requirements whenever necessary. Our standard packaging comes with the part number, description, manufacturer, lot number, and our Monroe Aerospace control number. If you require any additional information on packaging or packaging to your specifications please let us know how we can assist you. We can accommodate most packaging needs. Charges may apply for packaging requirements that significantly affect the process time of your order. Monroe Aerospace will make every effort to ship your order complete. If any items are backordered to you, we will ship those items to you in a timely manner. Monroe Aerospace will pay freight charges on all backordered items if they are stocking items for us. You will, however, be charged freight on backorder items that are brought in specifically to fill your order. We will also combine as many shipments as possible to reduce your freight costs. All ground orders received before 2:00 pm EST will ship the same day. All priority orders received before 4:00 pm EST will ship same day. All orders received after those times will promptly ship the following business day. Orders with over 20 items may ship the following day, based on what time your order was received. To ensure that your order ships when you need it to, please do your best to get them to Monroe Aerospace as early as possible. Monroe Aerospace will do our best to accommodate every customer’s needs. Monroe Aerospace accepts all major credit cards: (Visa, MasterCard, American Express and Discover). New customers who would like to open an account with a line of credit (NET 30), please allow Monroe Aerospace two to three business days to process your request. Bank of America is our primary bank when bank drafts are required (Wire Transfer Charge $25.00). Our PO (Purchase Order) minimum is $40.00. 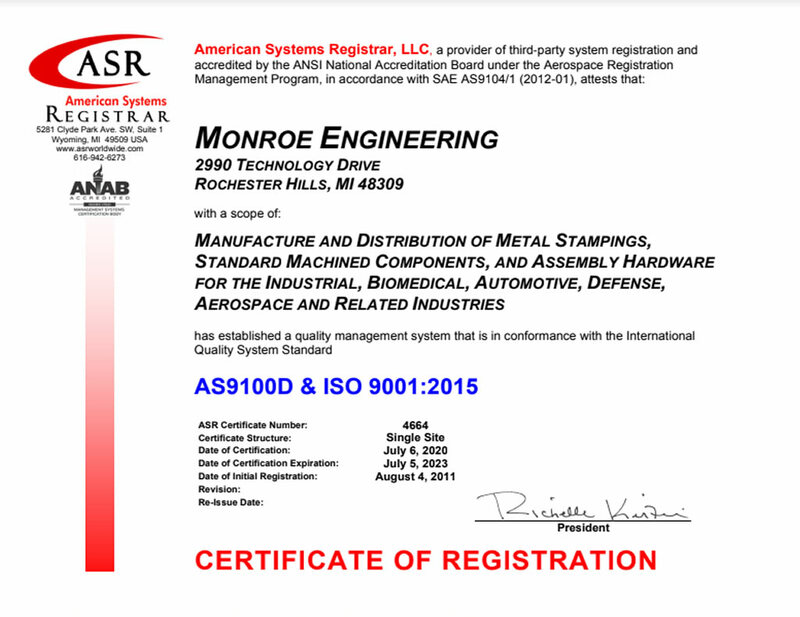 Manufacturer's certification is on file on all Mil-Spec and Aerospace fasteners. All parts are shipped with the manufacturer's name, lot # and/or control # on the parts label for your records. If you should require manufacturer's certification shipped with your parts, each part is subject to a $10.00 line minimum. Manufacturer's certification requested after the parts have shipped may be subject to a charge to cover the administrative cost of pulling manufacturer's certification. Please call your Sales Representative if you also require test reports on any items. A Return of Merchandise (RMA) number issued by Monroe Aerospace, Inc. must accompany any returned items. No credit will be issued on any parts returned without an RMA number. Monroe Aerospace, Inc. must be notified of any discrepancies or shortages within 30 days of receipt of your shipment for a credit to be issued. Credits and RMA's will not be issued beyond 30 days after items are shipped. Parts must be in the original packaging with the original quantity sold in order to receive a credit. We generally do not charge a restocking fee if the parts you ordered are regular stock items for us. Any parts that were brought in specifically to fill your order, if returnable, will be subject to a 50% restocking fee. Any specialty parts ordered are non returnable. If you should require technical information on any part, please contact you Monroe Aerospace Sales Representative. Monroe Aerospace has a full library of both government and proprietary prints and would be happy to assist you with any technical information you require. We appreciate your business and we will do everything we can to give you the service you deserve.